It is a measure of Ken’s reputation as a hockey player that he drew an assist on Gretzky’s 1000 goal. He was born on March 27, 1961 in Hythe, playing his first hockey at the age of seven coached by his Dad. He continued to develop his hockey skills at the peewee, bantam and midget levels in Grande Prairie where he played from 1973 to 1977. Ken was so skilled in minor hockey that the team who selecting him, conceded the next two draft choices to their rivals. While most of their games were played in the old Memorial Arena, Ken and his hockey buddies would often sneak into the Lewis Hawkes Pavilion or the Barn as they called it, where they scrimmaged on natural ice, often in the dark. At the age of twelve, Ken made his first tangible contribution to the Grande Prairie minor hockey program where his early skills were nurtured. In recognition of Ken’s agreement to be placed on their protected list, a goodwill contribution of $500.00 was provided to Grande Prairie Minor Hockey by the Medicine Hat Tigers. Because he was too dominating as a first year bantam at age thirteen, Ken was advanced to play with the undefeated Midget Knights where he won a scoring title and was named to the Peace Midget Hockey League All Stars. He led his Midget team to the Provincial finals, and to compete in Alberta’s prestigious Wrigley’s Tournament. Like other elite hockey players from small Canadian communities Ken had to be mobile in order to pursue his hockey dream. The years, 77 – 79 were spent playing in Medicine Hat and St. Albert in the Alberta Junior and Western Hockey Leagues. In St. Albert Mark Messier was a teammate and Mark’s Father, Doug, was their coach. In 78-79 he led the St. Albert Saints with 89 points and he represented the Medicine Hat Tigers in the 1981 WHL All Star game. By this time it was clear that Ken was an NHL prospect. The Chicago Black Hawks confirmed this in 1980 when he was drafted number 30 overall. Before turning pro, Ken returned to Grande Prairie as an instructor for hockey schools conducted by former coaches. Ken played professional hockey for six years from 1980 to 1986 with Chicago, Minnesota, Detroit and Edmonton recording thirty-nine points and scoring nineteen goals. You can imagine his excitement when he scored against Philadelphia’s Pete Peters in his first NHL game. Another first came while playing with the Minnesota North Stars against Buffalo during the 1981 Stanley Cup playoffs. He scored on his first shot of that series. Other teams in the pro ranks that Ken played for included Medicine Hat (WHL), Nashville (CHL), Birmingham (CHL), Adirondack (AHL), Springfield (AHL), and Nova Scotia (AHL). Wayne Gretzky, Mark Messier, Paul Coffee, Kevin Lowe, Denis Savard, Bobby Smith, Darryl Sutter and Dino Ciccarelli, were teammates during Ken’s professional career. Ken has never forgotten his small town Alberta roots. He pays special tribute to his parents and dedicated coaches who fostered his development through the ranks of minor hockey and into the NHL. 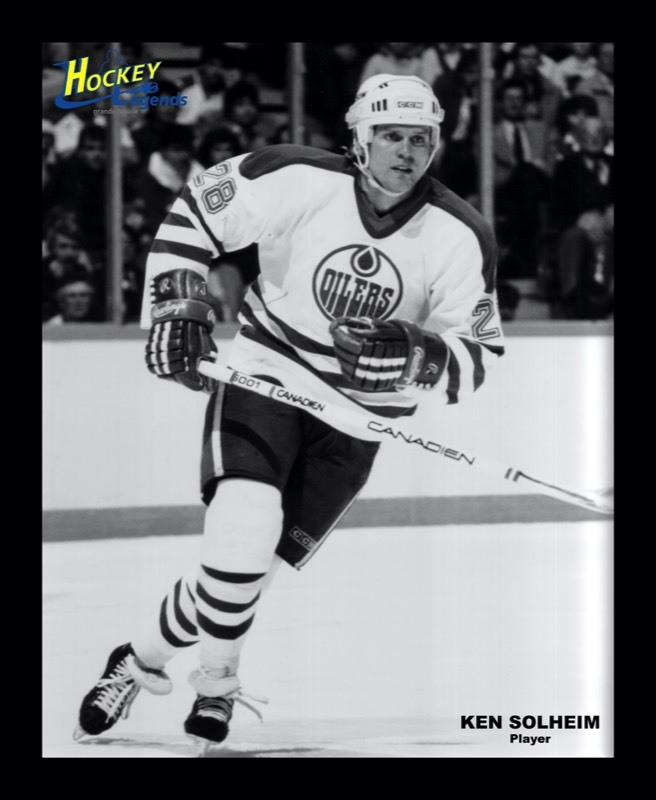 Ken Solheim - a Grande Prairie Hockey Legend in 2006.